Indiegogo calls itself “the world’s funding engine”, and whilst there are other crowd-funding engines in the same or similar markets, Indiegogo seems to have got it right, for me, they are the leaders. Acclaimed by the New York Times, TechCrunch, CNN, the Wall Street Journal, Mashable and NPR, Indiegogo has been recognised for its ability to link inventors with investors. That’s a powerful, yet simple equation. I for one have “bought into” (literally) a number of projects (or campaigns) through the site, and I’ve experienced great pleasure. The whole experience of making the choice, investing the cash, then following the campaign is tantalisingly exciting. Its a winning mix of heady retail therapy with directly informed decision-making; unlike the high street or Amazon, for example, there is no immediate or next-day gratification. In fact, buyers can wait months, even a year for their decision to become reality. The difference is, they can contribute their own developmental ideas to the product as it goes through design and testing. In some cases, as more backers sign up, the producers add more features, little unexpected bonuses. So there’s the element of uncertainty added, just to give the buyer a little frisson of gambling – pretty safe gambling, but gambling nonetheless. So how does this lead me to suggest that Indiegogo makes leaders? Simple: There are no qualifications required to start a campaign on Indiegogo, just a good idea, the ability to describe it clearly, and, the ability to organise a team to develop and produce it once funding is secured. It needs leaders and leadership. Simple? Well, yes, but the designer or engineer or idea-broker too has to be a driven believer in their product and in themselves – without these two qualities, the product is never going to get off the drawing board. This is truly the entrepreneur’s key to the kingdom, unlock it with a great idea, coupled with some smart marketing, the will and ability to deliver, and the campaigner may never look back. Expect to work like an entrepreneur, it won’t be glamorous, you won’t get rich off the campaign or the first product, but you will test every sinew of your belief. Do you have what it takes to take the lead? Have a look at my favourite campaign of the moment – yes, I’ve invested – it looks too good to resist, and I am convinced it will deliver on its promises – just look at the design and specifications yourself. Love music? 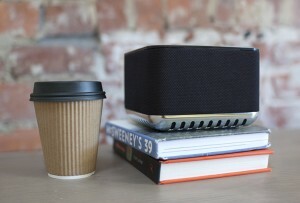 You’ll love this compact wireless multi-directional speaker with ‘better than stereo’ sound. Wireless. Multi-room. Portable. Truly liberating! “My Current Favourite – A compact speaker with ‘better than stereo’ sound.